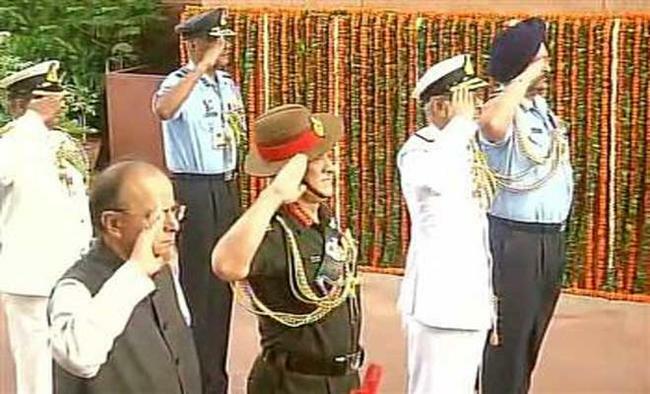 New Delhi: Defence Minister Arun Jaitley and chiefs of Army, Navy and Air Force on Wednesday paid tributes to martyrs to mark the Kargil Vijay Diwas.Jaitley, along with Army Chief General Bipin Rawat, Navy Chief Admiral Sunil Lanba and Air Force Chief Marshal B.S. Dhanoa, laid a wreath at the Amar Jawan Jyoti at the India Gate. "Salute to the valour of our soldiers on #KargilVijayDiwas," Jaitley tweeted. Kargil Vijay Diwas is celebrated on July 26 across India to commemorate India's victory in the Kargil War against Pakistan and to honour the war heroes.On this day in 1999, the Indian Army after fighting for 60 days successfully took control of posts in extremely difficult and treacherous high altitudes and glaciated terrain across the Himalayas in Ladakh region of Jammu and Kashmir.